The street-side signage is a dead giveaway. "Pu Jao Market at Sam Rong," it reads, vestiges of a marquee loosely discernible below. On the other side stands a cinema mausoleum. Entombed is the fanfare of movie-watchers from years gone by, desolate though it may otherwise appear. Street-side signage along the southern reaches of Sukhumvit Rd. There is no mention of a the theater anymore. The Pu Jao Theater stands as a concrete shell, stripped of absolutely everything that isn't embedded in it. Vendors at the Pu Jao fresh market, which is still in operation, rue the days when the Pu Jao was the life-blood of the neighborhood; a magnet for leisurists and guarantor of profits for hawkers. A woman grilling hot dogs beside the Pu Jao claimed that in the 1980's and 90's, it was the premier theater of Five Star Productions - one of Thailand's most prolific movie studios. Films starring the studio's prized male/female duo, Santisuk Promsiri and Jintara Sukapat, held their premiers at the Pu Jao. Regular capacity crowds spilled over into the surrounding businesses. 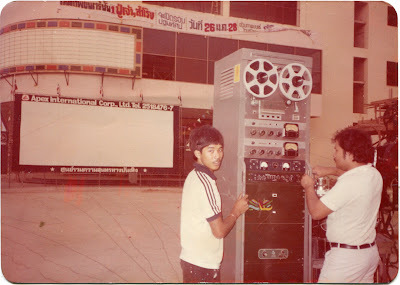 Then, in much the same manner as nearly all Thailand's stand-alone theaters, it died sometime in the early aughts. Seldom do I come across a vintage picture of a theater I've documented in its death throws. They're not so easy to track down. Which makes the above photo a rare treat. It shows a tiny bit of the Pu Jao Theater days before its grand opening. In the photo, Saman Watcharasirioj, a technician who works for the Apex chain, along with an assistant, set up the audio system for an outdoor movie screening in front of the Pu Jao. This must have been some sort of promotional event prior to the theater's opening. The Pu Jao was apparently owned by Apex. The banner above the marquee says, "A first-class theater, Pu Jao at Sam Rong. Grand Opening March 26th, 1985." The Pu Jao Theater is now a first-class relic. Innovative polycoats is one of the best PU Concrete services in pune. It is the best PU Concrete Flooring service provider in pune, India. Innovative polycoats is supply best Epoxy Flooring, PU Concrete, POLYURETHANE COATING, Antistatic flooring, Chemical Resistant Floorings, Deck Coatings, Industrial Epoxy Flooring, Densi Polished Floors in pune, India at best price. You share the great information about flooring services in your blog. Your content and information is really valuable for user.